If you like a friendly skull on your t-shirt then you should check out this smiling skull t-shirt. You can get his skull t-shirt in styles for both men and women and it is made from 100% cotton and it comes in sizes Small – 2XL and in a wide range of colors. On the t-shirt you just find a white and shiny skull with all it’s teeth still there and that makes it look like it is smiling at the world you show it. As there now is the perfect skull t-shirt you just have to order the perfect color and size for you. 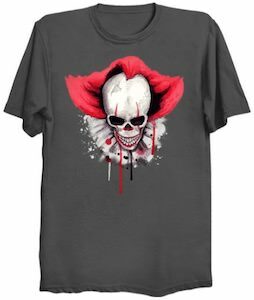 If you like scary clowns and would like a cool shirt then you should check out this clown skull t-shirt. The t-shirt comes in styles for men and women and it comes in many colors and in sizes Small – 6XL. On the shirt you can see a clown with funky red hair and then if you look again you can see that it is a skull and even some blood and goor is dripping from the skull and that makes it kinda scary looking and that makes it just fun to wear. Horror like this you can wear any day of the year or maybe just to scare kids when they come for trick and treat on Halloween. we know that wolfs howl at the moon and maybe this shirt explains why as this is a howling at a skull t-shirt. 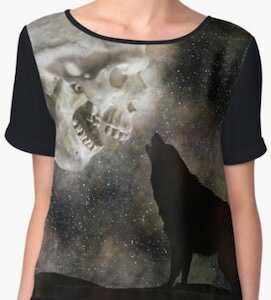 It is a chiffon top that has a black back and sleeves and on the front you can see the night sky and then there is a silhouette of a wolf that is howling at a skull in the sky. We know that wolfs like to howl at the moon but this t-shirt shows a skull so that makes me wonder if wolfs see skulls in the sky instead of a moon. You can get this women’s chiffon top in sizes XSmall – 2XL. If you are feeling a bit cold these days then you may be dead and that is why you need this life not found t-shirt. 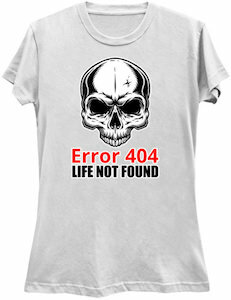 On the shirt, you can see a skull and below it says in red “Error 404” and below that the text “Life Not Found”. It is just like a 404 error you may get on the internet but now it came to real life as it shows the message on a t-shirt instead of a screen. You can get this t-shirt in many colors and in styles for men and women and comes in sizes Small – 6XL and they are made from 100% cotton. If you want to tell the world how to deal with zombies and walkers then you should check out this To Kill The Dead Aim For The Head t-shirt. The t-shirt comes in a range of dark colors and in style for men and women that will fit in a shirt sizes Small – 6XL. 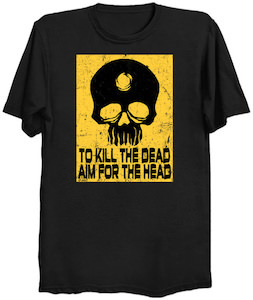 On the t-shirt, you can see a worn looking yellow square and in the square, you can see a skull with a bullet hole in it and below the skull, it says “To Kill The Dead Aim For The Head”. So if you want to educate the world about how to deal with the walking dead then you should be wearing this t-shirt. 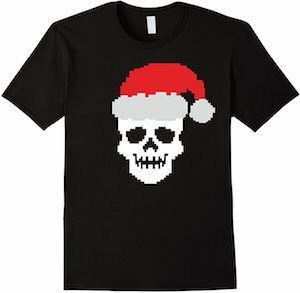 If you like skulls and Christmas then this 8-bit Santa skull t-shirt is what you need. The skull t-shirt is available in men, women’s, and kids styles and sizes and comes in black, blue, and gray colors. On the t-shirt, you can see a big white skull and it seems to be smiling and the fleshless face is wearing a red Santa hat making it just perfect for Christmas. So take your holiday skull t-shirt because now you can show the world that you wear a skull any day of the year and the Santa hat makes it all holiday ready. If your head hurts, do you wonder what is happening? If you do then this is the t-shirt that explains it all. 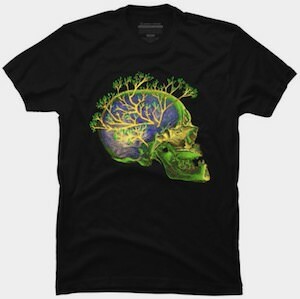 On the t-shirt, you can see a green and blue scan of a skull and inside it your brain and from there many tree branches are trying to get out. Does this mean that your brain tries to grow? 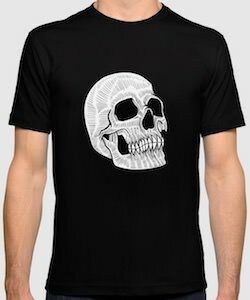 You can get this cool skull t-shirt in styles for men, women, and kids and it is available in many colors and sizes and even as tank top and sweater. Now you can show the world that you are getting smarter because your head hurts by simply wearing this t-shirt. 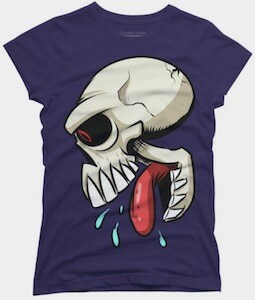 If you like skulls but want them to look more fun on a t-shirt then this skull t-shirt is the one you need. On this t-shirt, you can see that the skull did not loose it’s tongue as it is so clearly still there and it looks nice and red and even spit is flying around it. It’s a different view on skulls and if you like it then you just have to pick a color, sizes, and style and you are set. And yes this t-shirt is available for kids, men, and women. Show the world a different skull t-shirt by simply wearing this one. If you are looking for a very cool take on the sugar skull design then have a look at this t-shirt. On the front of this t-shirt you will see a white skull with black line art design making it a unique sugar skull. The skull has a heart shaped nose hole and red hearts fill each eye. Under the sugar skull you see two of cupid arrows crossed each with a red heart tip. On either side of the crossed arrows there is a wing detailed and white. Available in a wide selection of women’s scoop neck fitted t-shirt sizes that will range from XS to XL. It also comes with a choice of 7 different fun and vibrant colors. 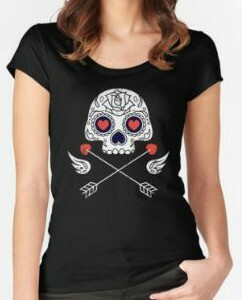 This t-shirt is perfect for Valentines day or every day wear to show off your love for sugar skulls and hearts. Check out the many different types of shirts you can get this print on too. This black women’s t-shirt is all about cards and a skull and if you like to see that on your t-shirt then you have to come get one. The women’s t-shirt has a v-neck and is made from 100% cotton and comes in sizes Small – 2XL. 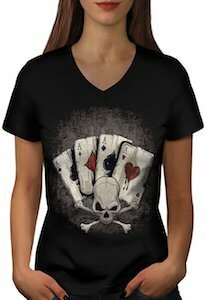 On the women’s t-shirt, you can see the 4 ace cards of a deck of playing cards and they seem to be held together by a skull and some bones. And the whole print on the shirt has a worn look giving it and even cooler effect. I just wonder if the poor person that lost it’s skull playing card did so because the game took that long.